18 GRIT GRINDING ACCESSORY. MORE AGGRESSIVE THAN THE DIAMOND DOTS. 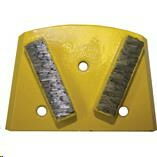 DESIGNED FOR COATING AND CONCRETE REMOVAL. WILL LEAVE A CLEAN, SMOOTH SURFACE WITH MEDIUM AMOUNTS OF SCRATCHES.